1979. That was a great year. I was born that year. As a matter of fact, my mother went into labor with me while she and my dad were watching Superman: The Movie, in a theater in Germany while my father was stationed there in the Army. So, I guess you could say I’ve been into comics since the womb? That has absolutely nothing to do with this review, save for the fact that this lovely issue here came out 5 whole months after I was born. Behold: Terrax! A herald of Galactus, and all around bad dude had his Marvel debut right here in these very pages. Let’s take a look at this meanie’s origin, and let’s also see just how dated the FF really are in this, the world’s greatest comic magazine! 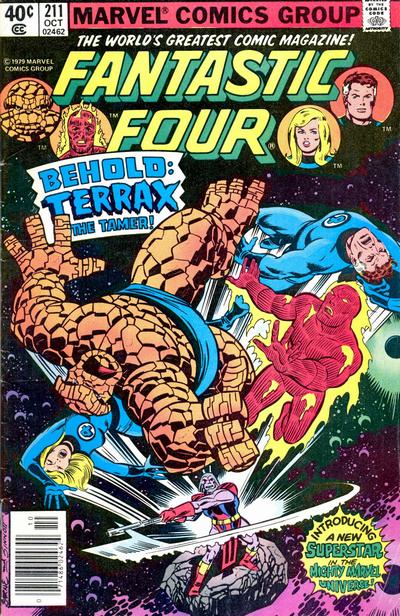 I’m talking about Fantastic Four #211! With a zap of energy, our story begins. With but a thought, Galactus, nemesis of the Fantastic Four, and would-be devourer of Earth, has teleported the team to a remote planet, deep in space. The FF, in the previous issue, had been blasted with an aging beam of some type, excelerating the aging process in all four. They’re here for a reason though: To find Galactus’ next herald! It’s not long before the inhabitants of this planet discover the Fantastic Four, and before you can say “Flame On!”, it’s clobberin’ time! That’s right. Some weird looking Knight type creatures are attempting to take the FF back to their ruler, but not without a fight! The Human Torch melts bad guys, the Thing clobbers, the Invisible Woman, well, turns invisible! All this, while Mr. Fantastic becomes the first to fall from a sonic weapon. The rest of the team falls soon after, as they are they taken captive and brought before the warlord master of this planet. Tyros rules through fear, and death, while he reaps the rewards and lives like the ruler he claims to be. At this moment, though, Galactus speaks to the FF! ” You must humble the one called Tyros before delivering him unto me!” This is who Galactus has chosen for his new herald, but how will the Fantastic Four be able to do what the Planet-Eater requests? It’s going to take all their combined might to do this… Can they? Marv Wolfman is a master creator and storyteller. Up to this point, he’d helped to create iconic characters like Bullseye, Blade, Nova, and the Black Cat, so here, with the introduction of Terrax, I wonder why it couldn’t have been more cinematic. Don’t get me wrong, it’s solid storytelling, to say the least, but when Terrax is created, the last third of the issue covers powers and demonstrations right up until Terrax challenges Galactus, to which Galactus informs Terrax of the grave mistake he’s not going to be allowed to make. For an issue from the time, it’s definitely dated, but flows. Wolfman takes us from one point to the next, but it all seems a little bland to me. Maybe it’s the dated aspect of the issue, and the cheesy dialogue of the times, but it just feels like a regular issue to me, not the epic that it should be. I mean, c’mon! this is another herald of Galactus! There have only been three others before this, and one of them died! We’re given the idea that Terrax is a bad dude, both before and after his transformation, but I think less time could have been spent on Terrax’s powers, and more on ample storytelling. I was left unfulfilled. John Bryne is a classic in the pencils department, and here his works shines. You definitely get the sense of the aging beam that had been enacted on the FF in the previous issue, and you also really get to dive into he landscape. Bryne’s work here is solid, holding us with each panel, picking up Wolfman’s slack with the lackluster script. The fight scenes look and feel great, and Bryne doesn’t disappoint with his sense of action and drama. Terrax, both before and after his change, look fantastic (hehe), and the visuals for Terrax after his change still hold true today! It looks great, it feels great, and Galactus looks very imposing, especially with Bryne’s artwork. I try not to be too hard on older books, especially since a good portion of them are severely dated. Cheesy dialogue and making each issue feel like it’s own enclosed story, while still trying to pull off that 3 issue arc are what give issues like this it’s flare, but sometimes, I that that can also be a downfall. It was almost painful to read Thing’s word bubbles, while trying to get a sense of the rest of the characters. Mr. Fantastic felt, well, plastic in his portrayal of character, while the Invisible Woman stood out more to me as a real character, with solid reaction and emotion. If there is one constant in this issue, in that both Marv Wolfman and John Bryne excel at, is Galactus. He looks just like he did when the greats, Kirby and Lee, introduced us to him all those issues ago, and he still gives off the sense of awe. For a character to do that, even in a lackluster issue, is very appealing to me. Fantastic Four #211 is definitely what it claims to be: an origin story for the new herald of Galactus. With minor action, minor drama, an a whole heckuva lot of explanation of power and whatnot, I think the truest of FF fans will dig it, but the rest of us could just move on, not coming away from this better or worse. Either way, at least we now know the lengthy, worded, history of Terrax. Yeesh. Parental Concern: None. Not one, flabbin’ bit.